We have two major concepts we use in the rollout game. We have labelled these concepts Out and In. These concepts only change the route of the Outside receiver. In addition, while they are based out of a 2×2 set they can easily be adapted to be run from a Trips set with minimal changes. In both routes every receiver except for the #1 to the side of the rollout will have the same routes. The #2 receiver on the side of the rollout will have a whip route. On this route he will angle in to the outside shoulder of the Overhang Player and attempt to step on his toes. He will pivot and release back towards the flat. By running in before releasing out he will create more space so that he is a viable threat to catch the ball in the flat and turn upfield. The #1 and #2 receivers away from the call will be attempting to get into the picture and create a receiving threat that the defense must account for. The #2 receiver away from the call side will be running a Drag. His goal is to get 10-12 yards deep by the time he reaches the roll side tackle and then continue working towards the sideline. If he finds himself running out of space or in an open area he will slow down and look for the ball. The #1 receiver on the Backside will run a Backside Post. 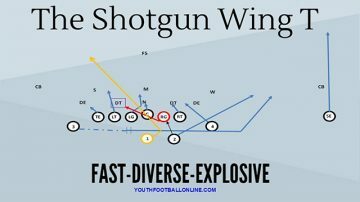 This is different than the traditional Post because it focuses on getting into the picture and being a possible target for the Quarterback. The first thing the receiver will do on the Backside Post is break immediately to the hash at a 45 degree angle. Once he get to the Hash he will climb vertical for 5 yards before planting and cutting again, this time he will take a traditional Post cut. This will help him get across the formation and get in the picture for the Quarterback. The route of the #1 receiver on the roll side is determined by the call. If the call is Out than the receiver has a Comeback. If the call is In the receiver has a Dig. This creates two different ways to attack the defense. As a general rule Out is the starting point. If the defense is over committing to the outside and getting under the Comeback than the In route will be open. When running these route from a Trips set everything will remain the same. The #3 receiver will now take the route of the #2 that is away from the roll side. Since he does not need to cross the formation he will climb to 10 yards before breaking out. The only exception to this is on the In Concept. The Dig from #1 would put #3 and #1 directly into each other so #3 will run a go route. The rollout game is a great way to help a young Quarterback. It takes him away from the pocket which gives him a clear line of sight and the ability to run. In addition, he is moving downhill which gives him some extra throwing power.